Flexflyte Super is a highly flexible black TPR ducting made from a 2-ply wall of thermoplastic rubber Santoprene, reinforced with axial and helical yarns and supported by a thermoplastic coated steel spring helix. It has good oil and chemical resistance and excellent weathering and ageing properties. Ideal for air conveyance in harsh environments such as engine rooms and under-bonnet applications. 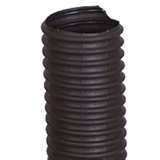 Suitable as a fume and exhaust hose or as an automotive and stationary engine air intake. This hose is now available in New Zealand from Flexiducting NZ and is ideal for use in garages and other enclosed spaces for ducting or extraction of exhaust, fumes, gases, vapours, dust and hot air.